Designed as a complete self-study program, this collection offers a variety of proven, exam-focused resources to use in preparation for the SHRM Certified Professional (SHRM-CP) and SHRM Senior Certified Professional (SHRM-SCP) exams. Comprised of SHRM-CP/SHRM-SCP Certification All-in-One Exam Guide, SHRM-CP/SHRM-SCP Certification Practice Exams, and bonus electronic content, this bundle covers 100% of the topics on the exams and features a total of over 800 accurate practice questions. The bundle serves both as a study tool AND a valuable on-the-job reference that will serve HR professionals well beyond the exams. William H. Truesdell, SHRM-SCP, SPHR, is President and founder of The Management Advantage, Inc. He is an expert on the subjects of personnel practices, employee handbooks, equal opportunity, and performance management programs. 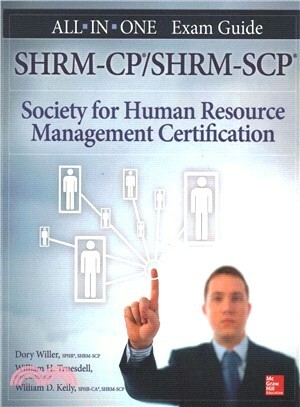 William Kelly, SHRM-SCP, SPHR, is the owner of Kelly HR, an HR consulting services firm. William has more than 40 years of HR experience. Joanne Simon-Walters, SHRM-SCP, SPHR, is a human resources leader with more than 15 years of progressive management experience. She is co-author of PHR/SPHR Professional in Human Resources Certification Practice Exams.